Doing English presents the ideas and debates that shape how we ‘do’ English today, explaining arguments about the value of literature, the canon, Shakespeare, theory, politics and the subject itself. explains to students why English, more than any other subject, is the cause of public debate and concern in the media and amongst politicians and educators. This popular and classic guide has been fully updated throughout to take account of recent research, educational changes and current events, and it now includes a chapter called ‘Why Study English?’ – showing how and why the skills taught by English are transferable to a range of careers. This immensely readable book is the ideal introduction to studying English Literature. 2. Where did English come from? How do those ideas still shape today? What does this mean for you, studying English? How do changes in the discipline affect your study of English? Is there a right answer in English? Why is there ‘jargon’ in English? How do you learn a ‘disciplinary consciousness’? Where should we start with thinking about how we read? What is the intrinsic attitude? What is the extrinsic attitude? How does the canon affect you? Why is Shakespeare so central to studying English literature? What are the traditional arguments for studying Shakespeare? What are some of the new ideas about studying Shakespeare? How do these ideas affect the way we study Shakespeare? 8. The Author is Dead? Who decides what a text means: the author or the reader? What is the traditional view of the author, meaning and the text? What are the problems with this view? How else can we determine the meaning of the text? Why has the author always seemed so important? What are the consequences of all of this? What are metaphors, and how do they work? How do we understand narrative and narrators? How is creative writing marked? How has creative writing changed doing English? What is politics, and what does English have to do with it? What do different critical attitudes mean for the issue of literature and politics? How does the study of literature become involved with national identity? Why has English been a political battleground? Why do English at University? What skills does it involve? 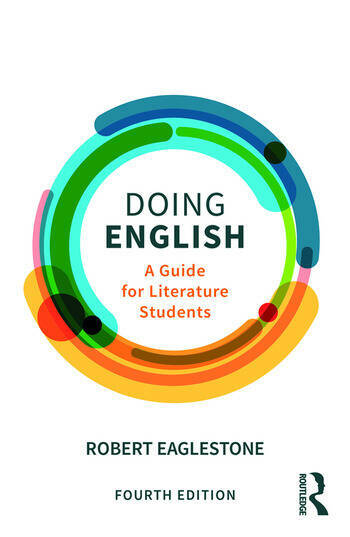 Robert Eaglestone is Professor of Contemporary Literature and Thought at Royal Holloway, University of London. He is widely published and has advised a range of government bodies and exam boards. In 2014, he won a HEA National Teaching Fellowship.